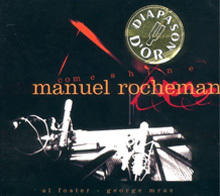 Manuel Rocheman’s voicings and touch are delicate, original, disciplined and swinging. One of the top French pianists on the planet, he has not been classified with the planetary top-level crowd. Unlike the frenchmen Jacky Terrasson or Laurent de Wilde, Rocheman has not been able to work often with a rhythm section that, like this one, is able to push him up a level. George Mraz, bass; Al Foster, drums. Le pianiste sur qui le jazz peut compter pour la vie.